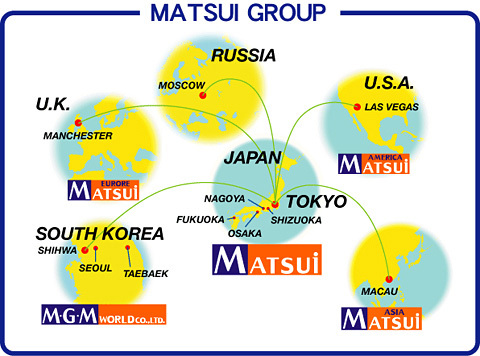 About Matsui | Matsui America Inc.
Matsui Gaming Machine, with a head office in Tokyo, three branch offices and a manufacturing plant in Japan, and 5 offices strategically positioned around the globe, is one of the world’s leading manufacturers and suppliers of live table gaming equipment. Matsui Gaming Machine was founded in 1980 by current CEO and president, Takashi Matsui, on a unique blend of passion for the gaming industry and a desire to provide the highest quality products at the most competitive prices. Japan, which is a world renowned through such companies as Sony, Toyota and Honda to name a few, is able to offer unique technology and manufacturing capabilities that MATSUI can call upon to meet the ever increasing gaming industry’s requirements. In recent years MATSUI has built both a Gaming Chip factory and a complete Gaming Equipment manufacturing plant to ensure they are able to design and manufacture a complete diversified range of quality gaming equipment. With the attention that Japan pays to customer service, MATSUI conduct themselves with professional and ethical standards in consultative sales. Having acquired this information MATSUI proceed to offer effective products and provide full technical support and an after sales service which is second to none.